On February 1, 2019, Lynn Vendinello, Acting Director, Chemical Control Division, of the U.S. Environmental Protection Agency’s (EPA) Office of Pollution Prevention and Toxics (OPPT) signed the pre-publication version of a notice announcing that, due to the recent lapse of appropriations and the Agency shutdown, EPA is extending the review periods for all Toxic Substances Control Act (TSCA) Section 5 Premanufacture Notices (PMN), Significant New Use Notices (SNUN), Microbial Commercial Activity Notices (MCAN), and exemption notices that were submitted to the Agency under TSCA Section 5 before December 29, 2018, and for which the review period had not expired as of December 29, 2018. Due to a lack of authorized funding, from December 29, 2018, until EPA operations for the TSCA New Chemicals operations fully resumed on January 31, 2019, certain EPA functions were suspended including the processing of submissions made through the Central Data Exchange (CDX), e-PMN, or other methods. Further, no review work was performed on the TSCA section 5 notifications received by EPA on or before December 29, 2018, and for which the review period had not yet expired as of December 29, 2018. Consequently, the review period for any TSCA Section 5 notice submitted during the shutdown did not begin until TSCA New Chemical operations fully resumed on January 31, 2019. 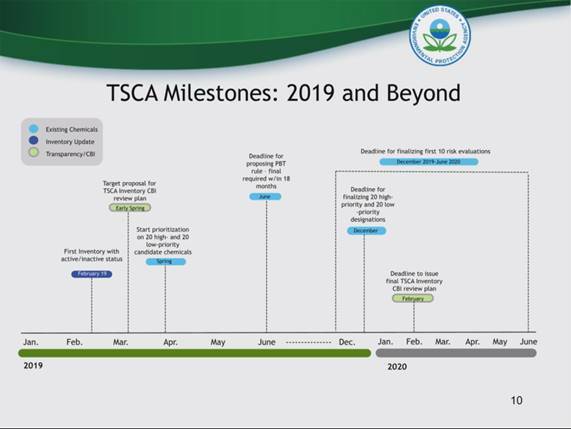 EPA states that the duration of the extension period will be a total of 33 days, which is equivalent to the duration of the time period from December 29, 2018 (the date on which certain EPA operations shutdown) and the date on which EPA operations for the TSCA New Chemicals Program fully resumed (January 31, 2019). The notice states that EPA requires an extension of the review periods to complete its risk assessments, to examine its regulatory options, and to prepare the necessary documents associated with the relevant determination under TSCA Section 5(a)(3). EPA Case Number: P-16-0415; chemical name: generic: polyurethane; polymer exemption flag (generic name); intended uses: coating for oil and gas industry; known and reasonably foreseen use(s): paint additive and coating additive. EPA Case Number: P-18-0002; chemical name: generic: phosphinic acid, P,P-alkyl-, salt (generic name); intended use(s) (specific): chemical intermediate for a non-halogenated flame retardant; known and reasonably foreseen use(s): chemical intermediate; flame retardant. EPA Case Number: P-18-0021; chemical name: generic: dicarboxylic acids, polymers with substituted poly (substituted alkendiyl), 3-hydroxy-2-(hydroxyalkyl)-2-alkylalkenoic acid, 5-substituted-1-(substituted alkyl)-1,3,3-trialkyl carbomonocyle, alkanediol, alkane-triol, alcohol blocked compounds with aminoalcohol; polymer exemption flag (generic name); intended use(s) (generic): paint; known and reasonably foreseen use(s): adhesive and sealant chemical. P-18-0044: chemical name: generic: fatty acids (generic name); intended use(s) (generic): intermediate species known and reasonably foreseen use(s): chemical intermediate; lubricant and lubricant additive; viscosity adjustor; coating. P-18-0045: chemical name: generic: fatty acids, alkyl esters; intended use(s) (generic): application coating; known and reasonably foreseen use(s): lubricant intermediate; mold release agent; plasticizer; processing aid. EPA Case Number: P-18-0083; chemical name: specific: 2-propenoic acid, telomers with bualc.-2-[(2-propen-1-yloxy)methyl]oxirane reaction products, sodium bisulfite and sodium 2-hydroxy-3-(2-propen-1-yloxy)-1-propanesulfonate(1:1), sodium salts, peroxydisulfuric acid([(HO)S(O)2]2O2) sodium salt (1:2)-initiated. (CASRN: 2118944-42-4); intended use(s) (generic): dispersant additive; known and reasonably foreseen use(s): chelating agent. P-18-0044, P-18-0045, and P-18-0083 are notable in that EPA identified a hazard other than “low hazard” for health or the environment and nevertheless concluded that exposures were low enough that the substances are not likely to present an unreasonable risk under the reasonably foreseeable conditions of use. In the cases of P-18-0044 and P-18-0045, EPA identified health hazards, but EPA expects that exposures to the general population will be low and that there will not be consumer uses. Furthermore, EPA expects that workers will “use adequate personal protective equipment.” In the case of P-18-0083, EPA identified acute and chronic aquatic toxicity concentrations of concern of >20,000 and >1,000 parts per billion, respectively. Even though these do not meet EPA’s thresholds for “low hazard,” EPA does not expect releases to exceed those thresholds. More information on TSCA’s implementation is available on our TSCA Reform News & Information web page. The U.S. Environmental Protection Agency’s (EPA) Office of Pollution Prevention and Toxics (OPPT or the Office) has decided to delay its pending reorganization to take and consider staff comments on the revised reorganization. The new plan proposes a six division structure that has separate new and existing chemical risk management divisions complemented by separate new and existing chemical risk assessment divisions. OPPT’s other functions are proposed to be distributed into a mission operations division and a division that sweeps together chemical right-to-know, economics, information reporting, and the Safer Choice/Design for the Environment (DfE) program. In an internal memo, OPPT Director Jeffery Morris, Ph.D., noting the thoughtful and insightful staff comments received on the earlier proposed reorganization, provides a two-week internal commenting period for the new proposal ending on May 9, 2018. How to organize OPPT has been a perpetual conundrum with shifting “best approaches” over time. From our perspective, merging the existing chemicals function of the Chemical Control Division (CCD) with those of the National Program Chemicals Division (NPCD) into an Existing Chemicals Management Division makes sense. The existing NPCD branches that cover legacy chemical issues (e.g., lead, polychlorinated biphenyls (PCB), mercury, and asbestos) will presumably become risk management branches tasked with overseeing risk management activities for those chemicals under the amended Toxic Substances Control Act (TSCA or new TSCA). The other “first ten” risk evaluation chemicals that are currently being managed by the existing chemicals staff in CCD will become other risk management branches in the new structure. 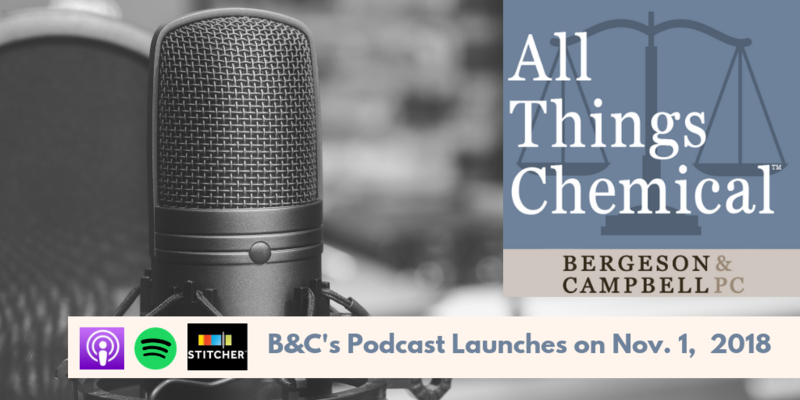 Creating a separate New Chemicals Management Division also makes sense in light of the challenges encountered by the office in its early implementation of Section 5 under new TSCA. Such a division will ensure a tight management focus on new chemicals issues without the need to also juggle complex existing chemicals issues. While this could present concerns regarding divergent decisions and policies between the two divisions, this seems to be less of an issue since the requirements in Sections 5 and 6 differ so much. More information and commentary on this reorganization is available in our memorandum.